Blockchain is a distributed, decentralized, public ledger that is changing the way people think about sharing data. It helps businesses break down barriers to create new trustful & verifiable networks, as it guarantees the validity of a transaction by recording it on a connected and public system of registers. 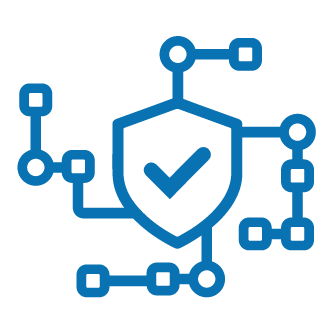 At BairesDev we offer full Blockchain Services to help you work in a smarter way, reducing risks and improving traceability and security. With more than 850+ projects successfully executed, our Software Engineers have a deep knowledge and extensive experience in providing Blockchain solutions. Blockchain is a distributed ledger that increases transparency among transactions. Every participant in the system has access to every document but needs permission to share or update them. Information is recorded and stored across a network of computers that are connected through a secure validation mechanism, making it very difficult for hackers to compromise the transaction data. As the system works using a single digital ledger, everyone has access to the same information becoming easier to trust each other and work in a more efficient way. Blockchain is a decentralized, distributed and a public digital ledger which means that anyone can transact and participate. But, as transactions are recorded across different computers and not in a single location, no record can be altered without changing subsequent blocks.